SCOTLAND coach Vern Cotter has made one change to his starting line-up for Saturday’s Six Nations match against Italy in Rome. Harlequins’ Tim Visser comes in on the wing, with Sean Lamont dropping on to the bench, as the Scots look to earn their first victory in this year’s tournament. The rest of the side is unchanged from the one that lost 27-24 to Wales in the last round of matches. Visser – who has scored 10 tries in 23 Tests – was included in the original squad, but a hamstring injury ruled him out of the opening rounds, returning to action in the past fortnight with two 80-minute outings for his club side Harlequins. 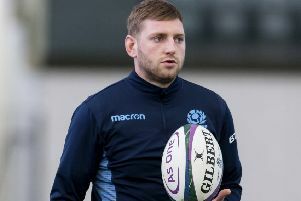 Edinburgh loosehead Rory Sutherland could earn his first cap off the bench after being named as a replacement alongside Glasgow flanker Ryan Wilson, who is recalled after not being included in the original Six Nations training squad. Also recalled to the bench is Glasgow centre Peter Horne, who can also cover the stand-off position. Exeter tighthead prop Moray Low is also named on the bench. Scotland Head Coach, Vern Cotter, said: “After a week off from the Championship, we have returned to camp fresh and fit, and have prepared well for what will be another formidable opponent. “Italy have shown they are a talented team, particularly in their performance away against France, but also against England. “They surprised both teams with their physicality, intensity and quality, all of which we will have to be ready for, and at least equal to, if we are to win in Rome this weekend.